Creatively Sustained is a shift in perspective and a personal manifesto. I grew up feeling very connected to my own creativity, to nature and the environment. I was the sensitive hippy in an ordinary, northern family. I pursued my creative passions as careers - fashion design, interior decorating, fine artist - despite the well intentioned and cautionary advice to avoid the 'starving arts.' I proceeded with enthusiasm anyway and met many challenges head on with grit and determination. But it never felt like enough. It always felt like something was missing. And I was always reminded of this in the form of exhaustion, burn out, depression, and/or debt. Whenever I turned my interests and hobbies into full time jobs - I inevitably came to resent the expectations, deadlines and production lines - of what were once expressions of pure creative joy. I've been on a pendulum swing between creative careers and salaried security for the last decade, and with growing life experience and hard earned wisdom I'm learning to smooth out the extremes. Creativity is not a job to apply for or a hobby that waits until the work day is over. Creativity is in me and around me and it influences my choices, my actions and my perspective every minute of everyday. To be Creatively Sustained is to recognize and honor this influence in my life each day through some form of self expression, however small or simple or fleeting. A photograph, a pencil sketch, a block print. Maybe an undocumented thought or observation. To become aware of what the present moment is offering as creative inspiration. Where is my attention drawn, what am I curious about, what would I like to be involved in? This curiosity drew us to the Passive House. It was built by the City of Fort St John as a demonstration home and education project for the community. Passive House is a European standard for energy efficiency that originated as a concept in the Canadian Prairies. My partner Paul and I became aware of the project, expressed our willingness to become involved, and eventually moved into the home as caretakers, ambassadors and tour facilitators for almost two years. Our City built the demonstration Passive House as an opportunity for the community to learn about energy conservation and low energy home construction as part of a 'living lab.' By having us live in the home and consume energy - turning on the lights, cooking, showering, doing laundry - like any normal family, the City was able to gather data regarding energy consumption as well as occupant comfort. In the end, the project confirmed that Passive House is well suited to a northern climate, uses up to 90% less energy than a conventional home, and provides ultimate comfort for occupants. In summary - what we loved most were the large, bright south facing windows, perfect to beat the long dark winters and enjoy free warmth from the sun. Passive House is so well sealed and insulated that there are NO drafts (and if you live in an older home in a cold climate you can only imagine what a luxury that is.) And the indoor air quality of a Passive House is unmatched in conventional buildings - there is dedicated fresh, filtered, circulating air 24/7 by design. We are so proud to have contributed to the success of this project, and although we no longer live there, my partner and I continue to be involved in learning about and promoting sustainable building practices including the Passive House standard. Becoming involved with the Passive House project was a way to support a solution and move forward - it was something positive to embrace - and it also helped me find my own voice. I found the courage to speak up for what I care about, what I value, and what we stand to lose. The Passive House was built as an energy conservation & education project but also - in part - as a response to the Site C Hydro Electric Dam that threatens the Peace River Valley. This is a big issue not only for the North East BC region where I was born and raised, but for the entire Province of British Columbia. This dam will be the largest and most expensive infrastructure project in the history of our province, and it threatens prime agricultural farmland, as well as Treaty 8 First Nations traditional territory and treaty rights. As a way to honor my time spent in the Passive House, and as a way to process the events unfolding around me, I later dedicated a full month, August of 2016, as a self-organized Artist Residency in the Passive House. It was a way for me to creatively explore my local Metis heritage, my own connection to the regional flora and fauna of the valley that I call home, all while living in the Passive House. I spent the entire month researching, sketching, carving and eventually hand block printing over 60 sq feet of fabric. I have since assembled the fabric into a full sized quilt, the quilt blocks representing pages of stories already written and yet to unfold. The cover is quilted in waves, like the ebb and flow of the river along its banks. 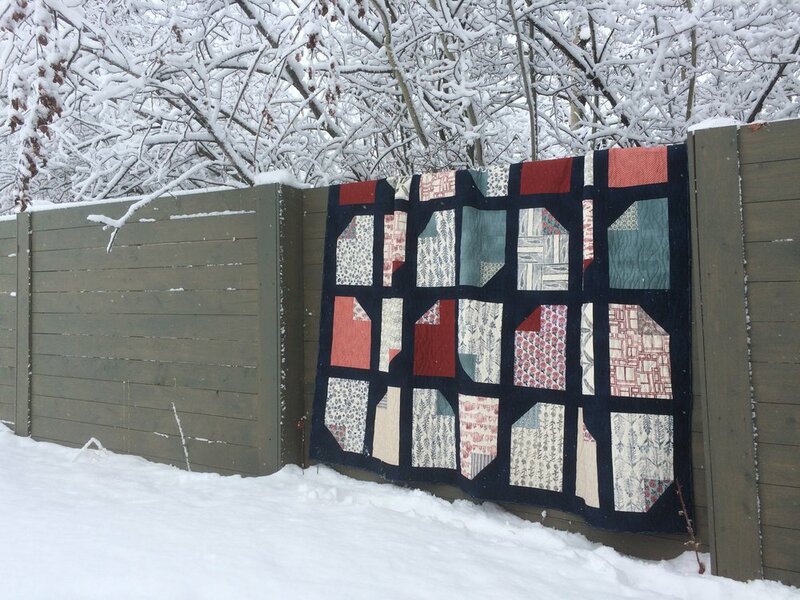 This quilt is a piece of my own history that am I able to carry with me, that connects me to my home. Rich with personal meaning its imagery depicts the origin story of Creatively Sustained - and it's a reminder to honor and value my own creative spirit - no matter where life leads me in the future.